Here is a useful reference tool, a chart defining the commonly encountered forms of unique rectangle, and appropriate solving idea. For details, see “The Unique Rectangle” in the Guide. Perhaps you’re curious about the Sudoku grids, x-panels, bv maps, and the curves, diamonds, and colors that you see in every post of this blog. Perhaps you would like to solve your puzzles with these aides, and send your work to friends. Maybe you’d even want to start your own Sudoku blog. If so I recommend WordPress, with standard themes and the free support system. It supports everything you see. When it comes to the technology, there is no need to re-invent the wheel. The PowerPoint and Word templates I use are my own and are available free via email from sysudoku@gmail.com . I reply to your requests with attached short files. As to graphics, you can use any image processing program that captures the images and produces a standard image file. My image processor is Paint. On this page, I identify what the template files are, and explain in detail how to use each one to produce this blog. The PowerPoint, Word and Paint programs are universal in MS Office systems. 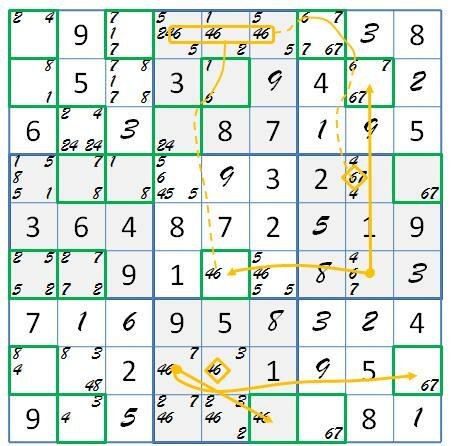 You don’t have to ”know” PowerPoint or Word to use these templates for capturing and solving Sudoku puzzles. Don’t expect this kind of human solving support from the “app” world. The details of tough Sudoku solving is not very convenient on the miniature screens and keyboards of today’s social networking devices. As you can see from reading this blog, it needs more room. 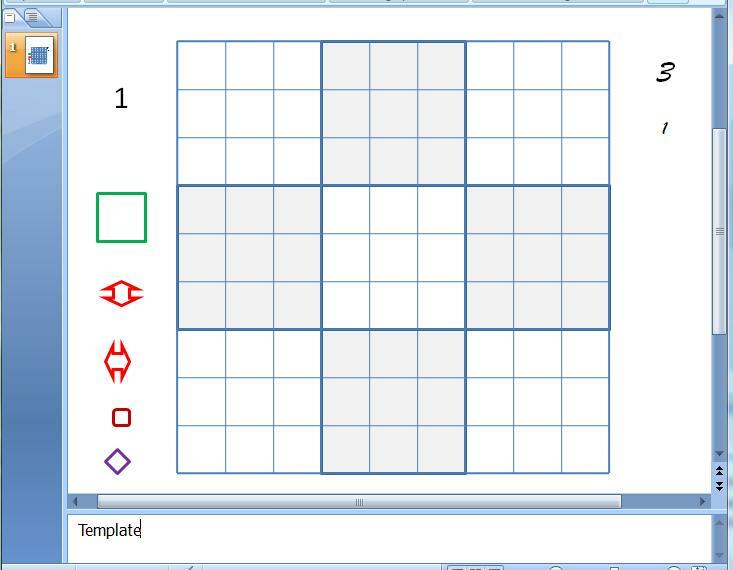 Load the Grid Template file when you are ready to transcribe a new puzzle for solving. Use the “Restored Down” Window with “Normal” View, with miniature slides window on the left and comments window below. The letters are text boxes with “No Outline” selected. To change value, drag across it to highlight the letter, then type the new value. To insert the letter into a grid cell, click the boundary to get the “four arrow”, “moving it” mouse icon, press Cntrl and C keys to copy the text box to the Clipboard, then the Cntrl and V keys to paste a copy on the template, offset from the original. Then drag the offset copy into the cell. I start with 1 and fill in all the 1’s, then alter the text box to 2 and fill in all 2’s, etc. Before altering the template or soon after, save the file, giving it the name and folder location you desire. This preserves the template for the next puzzle. After checking the boxes against the puzzle, select the entire grill with a mouse drag, and Group it, under the Arrange button, change the “Template” to rename the puzzle, and add any other comment you want. Now you are ready for box marking, but do it on a second slide. In Windows Vista, I click “New Slide” on the Home menu, then “Duplicate Selected Slides” on the drop down window. A second window is highlighted in the Slides window. I alter the comment to “1:”, and I’m ready to begin box marking. I use the comment box for 1-D tracing as I box mark, then duplicate the slide for line marking. If I want to preserve a picture of the grid at a significant moment, I simply duplicate the slide as above, and continue from there. If the box marking trace gets too “nesty”(see Sysudoku Traces) I switch to a 2-D trace on a Word window. Later I add a blank slide and transfer the trace to a text box in the presentation file. An occasional Cntrl-S saves the files as I go. That covers the mechanics of box marking on the puzzle grid. To understand how it’s done, read through the Beginner’s page and early posts. On a duplicate slide, I first add the bv boxes, by copying the bv square to the Clipboard, and dragging pasted copies to the bv cells. The new comment begins with “3f:” or “4f” or whatever is the smallest number of free cells. I usually delete the Calibri text box, and drag the larger Script box over to that position, to have more space on the right side. To set up a line string, I copy a single candidate I know is in the string, drag it into position, widen the boundaries, position the text editing cursor within the text box, and add the remaining numbers. Or I just copy the string of a neighboring line and alter it. When counting free cells for the next line to mark, remember to count the cells of closed sets on the line as not free. If that is gobble-de-guk, it won’t be when you learn to line mark. When I duplicate the last line marking slide for advanced solving, I select the line strings and delete them, to gain room for extra candidate boxes. Line marking often calls for moving or duplicating candidate boxes to mark slinks. Easy. But if you miss, and the whole grid disappears, don’t panic. Remember the “undo” button on the top bar of the window. You may encounter an X-wing or even a finned wing in line marking. The posts have many examples using the wing, fin and removal icons in line marking. I deliberately omit marking X-wings made up of box marks to avoid the clutter of dead ones. Bi-value cells are next best to new clues as human solver horses, when properly harnessed. In sysudoku solving, the bv, as we call them, are first used to crack Sue de Coq and APE cells. Then we bring up a blank set of bv tables, and fill in the top table with bv candidates. Then we drag over the table and Ctrl-C copy and Cntrl-V paste the bv into the second table on the file. The file is Saved As … the bv map for the puzzle at hand. 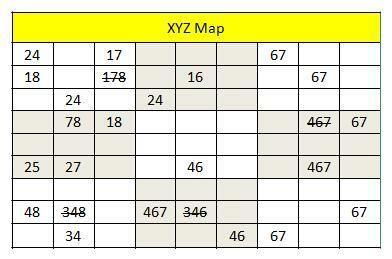 Next, we search one of the tables for XYZ-wings. The process is well illustrated by the XYZ map of one of the Super Tough puzzles from www.krazydad.com , Super Tough v.5, b.2, n.5, or ST 525. When two pairs of a 3-value cell appear as bv on the map, we type the values into the map as a potential hinge, regardless of relative location. A 456-cell was considered, for example, but was not entered because only one pair, 46, appeared on the bv map. On the other hand, 178 was entered in r2c3, because bv cells included 17, 18. It failed because the 78 cell value could not “see” the hinge 7 or 8. The XYZ-wings are covered in several posts. The potential hinge 348 in r8c2 failed because all three cells of the wing are in the same box. That makes them a closed set, a naked triple, but no external candidates can all three 4-candidates. One of the 467-hinges fails , but two succeed. The bottom one is a regular 467-wing removing a 6-candidate. The top one regular as well, but what gives me special joy is the forcing chain by which the 6-candidate victim sees the 6 in wing bv r6c5. The posts also contain many examples of XYZ-wings constructed with forcing chains. You can understand now how the XYZ map makes such discoveries possible, by concentrating your attention on just the right candidates. The grid above also features the curve shape used for the XYZ-wing arrows, and for the forcing chain. In the post I always draw the wings in orange. I use a width of 2 ¼ for the wing arrows and 1 ½ for the chain links. To draw a curve, get to the shapes menu in Insert, select the curve shape and click the starting point on the grid. A curve is drawn through the points clicked in a series, ended with a double click. At any time before ending the curve, you can “back out” of points with the Delete key. The default color is blue, and the width is 1. With a curve selected the Format bar or section shows a Shape Outline icon that brings up menus for color, width, dash style and arrow style . It’s so easy. 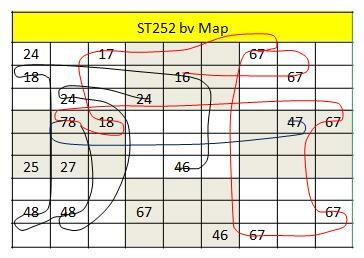 At a solving point after the above grid, the bv map had changed and curves were drawn on the map to connect bv candidates with other bv candidates that they could see. Some connections were skipped, but looking at the grid, the potential xy-chain toxic pairs were included. I call the result the xy-chain tracks. The curves actually organize the bv into xy-chains. Junctions restrict travel along the tracks to the proper direction. 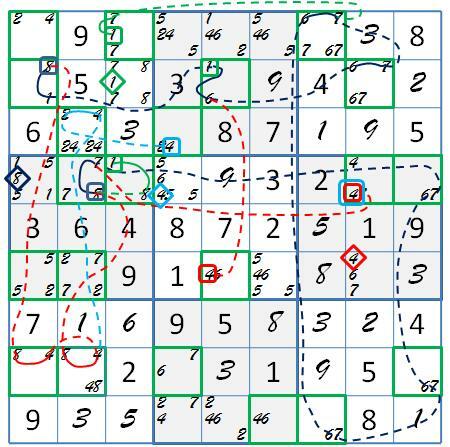 You see the potential ANL as you draw the curves, and can immediately draw each one on the grid as it is discovered. The result in this case is awesome. Toxic sets are marked for each chain. The black chain 816767678 removes an 8-candidate, and the green extension 17676781 removes a 1-candidate. The red chain 46184874 shares a section of the black chain. The light blue chain 424874 shares a section of the red chain. It just wouldn’t be humanly reasonable to find these chains without the guiding tracks of the xy-net. Of course the removal diamonds and the rounded squares are the shapes included on the grid template. Changing colors and line width was explained earlier, but note the two sizes of rounded square in r4c8 to denote a 4-candidate belonging to two toxic sets. Resizing the icons is a simple drag. You probably know that in the blog, an xy-chain and its victim also form an almost nice loop, or ANL, as the victim provides two weak links closing the alternating strong and weak links, the slinks and winks, of the chain. In the advanced blog you will find closed curves used to mark closed sets, almost closed sets or ALS, and AIC hinges. These are drawn as ordinary curves, but as the curve is closed, the closed figure is given a default fill color, obscuring the drawing layers below. With the curve still selected, go the fill icon of the shape format section and select “No fill”. A very useful drawing tool to know is the format painter. It is the paintbrush icon on the Home menu. The properties of a selected object are transferred onto a second object by clicking the format painter, then clicking the format painter icon on the second object. Drawing the chains in the above grid is a good example. Once you have one solid segment and one dashed segment of a chain, all of the other segments can be painted with the color, line width, and dash style with two clicks. The X-panel is a 9 by 9 table with a header line across the top. Usually it contains single digits of the same number, representing candidates of that number across the grid. I actually have three forms of X-panel in my sysudokie tool box. Most often used is a Word table of twelve X-panels, giving me one table for each number, plus three spare panels on a bottom row. My first action after the bv scan is usually to fill this table with an X-panel for each number X. Having the candidates of a number isolated from everything else makes fish and X-chains much easier to spot. I search for both as I fill the table, one number at a time. The X-panel usually remains private, while I transfer the fish or X-chain to the grid for display. On the second page of the X-panel file is a single X-panel, for publishing how something looks on the X-panel, as opposed to the main grid. I did use it for awhile for designating enumerated patterns by letter, because the Word table expands nicely to accommodate letter strings of different sizes. I abandoned it in favor of a PowerPoint X-panel, even though I have to adjust column size by hand, because I got clearer pictures of the PowerPoint version from Paint. Finally I have PowerPoint file of one slide consisting of twelve individual X-panels. I could use it for all the above, but Windows gives me an easier time displaying a Word page and a PowerPoint slide on the same screen, which I need in most of the above. It’s a PowerPoint puzzle template slide and a Word X-panel table most often. The PowerPoint X-panel slide is best for pattern enumerations. Zooming is easy for freeform drawing, and I can re-arrange panels to include just the ones I need. Another advantage is that slide X-panels can be included with the presentation solving record, often making the archive copy a single file. I’m not expecting you to start a blog, but I’ve shared these production details to show how you can create files aiding and documenting your Sudoku solving adventures. These presentation and enhanced text files can be easily shared with sysudokie friends in many ways. I have been sending you emails but no response. On vacation?